The summer of 2015-2016 was one of the hottest on record in Australia. But it has also been hot in the waters surrounding the nation: the hottest summer on record, in fact. 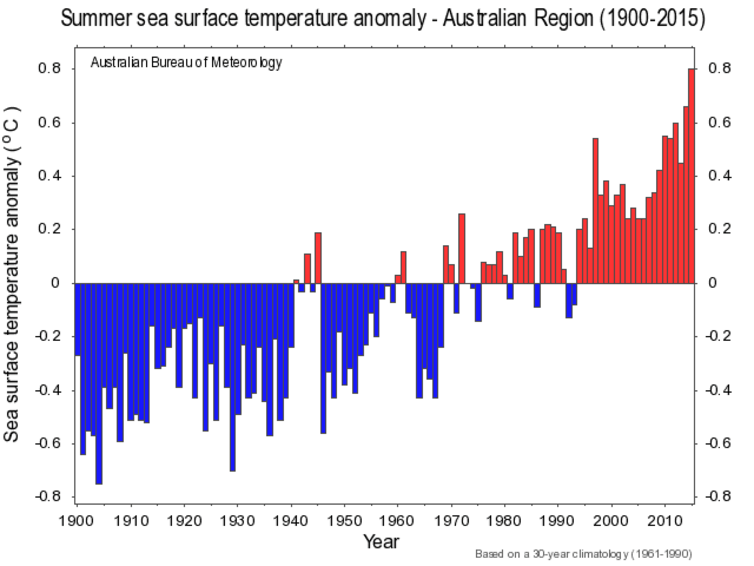 Difference in summer sea surface temperatures for the Australian region relative to the average period 1961-1990. While summer on land has been dominated by significant warm spells, bushfires, and dryness, there is a bigger problem looming in the oceans around Australia. This summer has outstripped long-term sea surface temperature records that extend back to the 1950s. We have seen warm surface temperatures all around Australia and across most of the Pacific and Indian oceans, with particularly warm temperatures in the southeast and northern Australian regions. Last summer’s sea surface temperature rankings for Australia. In recent months, this warming has been boosted – just like land temperatures – by natural and human-caused climate factors. These record-breaking ocean temperatures around Australia are somewhat surprising. El Niño events, such as the one we’re currently experiencing, typically result in cooler than normal Australian waters during the second half of the year. So what is the cause? The most likely culprit is a combination of local ocean and weather events, with a substantial contributor being human-caused climate change. In the north, the recent weak monsoon season played a role in warming surface waters. Reduced cloud cover means more sunshine is able to pass through the atmosphere and heat the surface of the ocean. Trade winds that normally stir up the water and disperse the heat deeper into the ocean have also remained weak, leaving the warm water sitting at the surface. In the south, the East Australian Current has extended further south over the summer. This warm current flows north to south down Australia’s east coast. Normally it takes a left turn and heads towards New Zealand, but this year it extended down to Tasmania, bringing warm waters to the south east. This current is also getting stronger, transporting larger volumes of water southward over time. This is due to the southward movement of high pressure systems towards the pole. High pressure systems are often associated with clear weather in Australia, and when they move south they prevent rain. This southward movement over time has also been linked to climate changes in our region, meaning that changes in both rainfall and ocean temperatures are responses to the same global factors. We’ve also seen high ocean temperatures in the Indian Ocean. Around 2010, temperatures in the region suddenly jumped, likely because of the La Niña event in the Pacific Ocean. The strong events during this period transferred massive amounts of warmth from the Pacific Ocean into the Indian Ocean through the Indonesian region. The warmer waters in the Indian Ocean have persisted since and have influenced land temperatures. The five years since the 2010 La Niña are the five hottest on record in southwest Western Australia (ranked 2011, 2015, 2014, 2013 and 2012). The world’s oceans play a major role in global climate by absorbing surplus heat and energy. Oceans have absorbed 93% of the extra heat trapped by the Earth since 1970 as the greenhouse effect has increased. This has lowered the rate at which the atmosphere is warming – which is a good thing. However, it also means the oceans are heating up, raising sea levels as well as leading to more indirect impacts, such as shifting rainfall patterns. As a nation that likes to live by the coast as well as enjoy recreation activities and harvest produce from the sea, warmer-than-usual oceans can have significant impacts. Australia derives a lot of its income from its oceans and while such impacts aren’t often seen immediately, they become apparent over time. Warm sea temperatures this summer and in the past have seen declines in coral reef health, and strains on commercial fisheries and aquaculture. The Great Barrier Reef is currently experiencing coral bleaching amid very warm water temperatures. Our neighbouring Pacific islands have also seen the impacts of these very high sea surface temperatures, with recent mass fish kills and coral bleaching episodes in Fiji. The impacts of warmer ocean temperatures are also felt on land, as ocean temperatures drive climate and weather. Abnormally high sea surface temperatures may have contributed to the intensity of Cyclone Winston as cyclone potential intensity increases with ocean temperature. The seasonal outlook from the Bureau of Meteorology shows El Niño weakening over the next few months. This typically means cooler weather and can mean more rain on land. However, closer inspection shows surface temperatures over the entire Indian Ocean and coastal Australian waters will very likely continue to remain well above average for the next few months. There are currently signs that surface currents are moving warm El Niño waters from the eastern Pacific over to the western Pacific, towards Australia. There is potential for the East Australian Current to continue to transport this warmth to southern waters as far as Tasmania. Warm water could also be transported through Indonesia and travel south along the Western Australian coast via the warm Leeuwin Current, potentially causing further warming of already record warm waters. So for the near future, the waters are going to continue to be warm. That’s good news if you’re heading to the beach, but not so good for the environment.